Flexible Manufacturing (FM) is a very adaptable manufacturing process developed to react rapidly as demand patterns for different products change over time. In flexible manufacturing, customers have the option to request and receive customized versions of products to meet their needs and specifications. Flexibility is a word that has been incorporated in the way of doing business today. Flexibility, from a manufacturing point of view is the capability of producing different parts or finished goods without major reorganization. It is also the ability to change a production program, to modify a part, or to handle multiple pieces. From an operational approach, it is the ability to efficiently produce highly customized and unique products. Strategically, it is the capability of a company to offer an increasing number of product variants to its customers. Finally, flexible manufacturing is the ability to quickly increase or decrease production levels or the ability to move rapidly from one product or service to another. Flexible Manufacturing is a form of adaptive automation wherein various processing machines are linked together by a material-handling system, and all aspects of the process are controlled by a central computer system. 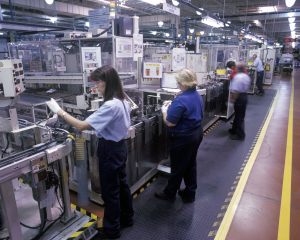 At any time, each machine in the system can process a different type of product. Thus, FM consists of a set of machine tools, along with handling devices, arranged in a manner they can handle any assemblage of parts for which they have been designed and developed for. The ability to identify and distinguish among the different part styles processed by the system. Quick changeover of operating instructions. Quick changeover of physical setup. Flexible Manufacturing can also cope with the changes in the variety of products and in the production schedule. New styles of goods can be introduced into production with Flexible Manufacturing, provided they are within the range of possibilities for which the machines have been designed for. Flexible Manufacturing gives companies an advantage in a quickly changing manufacturing environment, but it may not always be the best method for every organization due to its high implementation costs. Organizations need to analyze thoroughly if an FM process is suitable for their circumstances and needs. Only by carefully studying and planning its establishment, will an organization ensure the benefits of having a flexible manufacturing process.